The Weiss choice is the right choice. 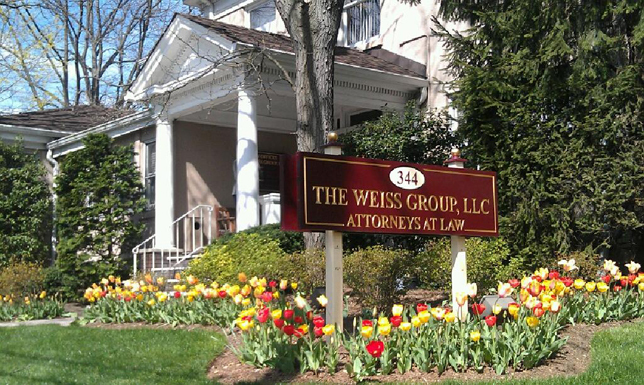 We are licensed to practice law in the state of New Jersey. We focus on Personal Injury, Worker’s Compensation, Family Law, including Divorce, Child Custody Matters, Domestic Violence, Name Changes, Powers of Attorney, Municipal Court Matters, DWI/DUI, and Medical and Legal Malpractice. We encourage you to call one of our attorneys for a free initial consultation. We have extensive experience representing individuals, families and businesses in complex legal areas. We always tailor our approach to reflect our clients’ needs, goals and concerns as they pursue favorable outcomes and lasting solutions. You need peace of mind at this troubled time in your life. Our comprehensive legal knowledge, dedication to your goals and persuasive people skills can provide that peace of mind. Motor vehicle. Pedestrian trip, slip and falls. Wrongful death. Punitive claims against drunk drivers. Work related injuries including occupational exposures to harmful environments. Camp injuries. Student injuries at school. Claims against public entities. Dog bites. Supermarket injuries. Workers injured. Product defects. Municipal court. If you have been injured on the job then you may be covered for the cost of treatment, lost wages and permanent disability, according to New Jersey Workers Compensation Law. We handle all claims for work-related accidents, diseases, occupational exposure and conditions that are covered by Workers Compensation. These claims are often denied by insurance companies and we will fight for you. All employers must carry Workers Compensation Insurance for every employee. Municipal Ordinance Violations such as: Noise, Zoning, Permits, Barking Dogs and Signs. Penalties can include fines, points on your license, loss of driving privilege and, in some cases, jail. We strive to avoid these penalties. Less than 1 block from the Metuchen Train Station, and convenient to the NJ Turnpike, Garden State Parkway, NJ State Highway 27, US Highways 1 & 9, and Interstate 287.